Multi-technology-based module design incorporates different integrated circuit (IC) and printed circuit board (PCB) process technologies implemented with different design tools. To offer smaller devices with optimum performance, it is common for front-end module (FEM) manufacturers to integrate gallium arsenide (GaAs), silicon germanium (SiGe), or radio-frequency complementary metal-oxide semiconductor (RF CMOS) power amplifiers (PAs), CMOS or silicon-on-insulator (SOI) switches, and acoustic filters—all mounted on a single laminate package. This article presents a unified design flow for full module simulation, inclusive of all process technologies, that enables designers to leverage the strengths of specialized electromagnetic (EM) modeling and circuit analysis tools to address various functional block technologies, maintaining all through a single environment. The module design in this case is a dual band, 1.9 GHz (cellular)/ 2.5 GHz (wireless local area network [WLAN]) FEM that includes two PAs (GaAs and SiGe), surface-mount bulk acoustic wave (BAW) filters, and a laminate substrate. This FEM used full design simulation, inclusive of EM verification and yield optimization, allowing the designer to not only understand the design sensitivity to specific component and manufacturing tolerances but also to compensate for the impact of these variations on the overall design performance in order to achieve a more robust end-product. Multi-chip module designers face a multitude of design challenges relating to the manufacturability of complex multi-layer substrates. Included in these challenges are many uncorrelated factors associated with substrate fabrication, such as registration errors or etch-tolerance of the package trace metals. 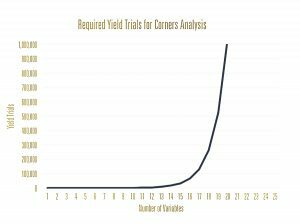 While a corners analysis would be a typical process for IC design, doing it for yield analysis of a module with a large number of variables becomes impractical very quickly, as the number of yield trials required grows exponentially with the number of variables (Figure 1). For example, consider a five-layer module with 10 surface-mount components. Here there might be five variables each for registration, under/over etch, and dielectric variation, as well as 10 variables for the variation of the surface-mount parts, resulting in 33.55 million yield trials. No reasonable designer could wait for the simulation results for such a large amount of simulation trials. Another challenge concerns capturing the component-to-component interactions in a module design that often contains multiple technologies that are analyzed with separate, specialized IC-and PCB-focused simulation tools/design flows (Figure 2). While designers rely on tools that are efficient for designing each constituent part of the module, at some point in time, they do need to bring all of these disparate designs together in order to perform a full system simulation and verification. If the component tools are interoperable, designers are able to quickly simulate and verify the full system design more readily. A simple example of this would be a case where a silicon chip (RFIC) is designed using a Cadence tool and the PCB is designed with NI AWR Design Environment, specifically Microwave Office circuit design software. To address these challenges, Microwave Office software offers an integrated design flow for harnessing multiple simulation technologies developed specially to address individual components found in multi-chip module design. Tool interoperability between NI AWR Design Environment and third-party specialized tools allows designers to incorporate existing IC designs represented as blocks within the overall multi-chip/substrate simulation. In the example discussed above, the RFIC was imported as a Cadence-generated Spectre circuit simulator netlist into NI AWR Design Environment, which was then directly simulated in the Spectre netlist block using the APLAC harmonic balance/transient circuit simulation engine. Designers can therefore turn their attention to optimizing off-chip design, interconnect, and matching network modeling, as well as yield or corners analysis. Design centering for improved yield analysis can also take place through surface-mount component selection or laminate redesign directly in Microwave Office. Alternatively, a parameterized Spectre netlist containing S-parameter data sets from the yield analysis can be exported from the NI AWR Design Environment and used within Cadence to address design centering for higher yields at the RFIC level. To expedite yield analysis with a more efficient alternative than corners analysis, Microwave Office software provides Monte Carlo analysis, which can give meaningful yield results with many fewer yield trials. In addition, even though Monte Carlo analysis is more efficient, there will still be a large number of yield simulations that need to be performed, which can be very time consuming. Thus, software such as Microwave Office also provides the ability to distribute and parallelize these simulations among remote servers, thereby further reducing the amount of time it takes for engineers to obtain their yield results. Monte Carlo yield analysis consists of performing a series of trials or iterations. Each trial results from randomly generating parameter values according to its specified statistical variation, performing a simulation, and evaluating the result against stated performance specifications. It is easy to compute the number of yield trials required to achieve a specific yield percentage with an acceptable error percentage for a particular confidence level. For example, if the yield is 90 percent, a one-percent error in results is acceptable, and the confidence level is 95.4 percent, with the equivalent number of yield trials at 3600, as shown in Equation 1.
where Cσ is the confidence expressed as a number of standard deviations. A confidence level of 95.4 percent equals a standard deviation of 2, therefore the number of trials is calculated at 3600, or in equation form: N = (2/.01)^2 x .9(1-.9) = 3600. Given that Monte Carlo analysis is not a function of the number of variables, the designer can get meaningful yield analysis results for problem spaces with a large number of independent variables with much fewer trials than a corners analysis. NI AWR Design Environment supports the analysis of manufacturing variations, which is especially useful in laminate design. The software offers layer-based modifiers that shift entire layers, making setup very straightforward when looking at the registration error, over/under etch factor, particular manufacturing variations, parametric material dielectric variations, or surface-mount part tolerances. Because they are simply parameters, the designer can do a parametric sweep or set up a particular yield distribution for these parameters. Even more conveniently, the environment provides a viewer with connectivity for visual verification of these geometry modifications. To elaborate on layer-based shape modifiers, when looking at the spiral inductor on the left in Figure 3, it can be seen that the metals are all the same width and, in addition, are all aligned with each other in the Z axis. It can be seen that there is no registration error. In the spiral inductor on the right, however, the layers have shifted independently of one another in the X and Y axis. In addition, the pink one has become thicker and the gold one has become thinner. These issues correspond to the registration error as well as the over/under etch. For each layer there might be one modifier and then the amount that it moves each layer can be assigned a parameter based on a statistical variation, as shown in Figure 4. Setting up the statistical variation for the dielectric constant in this module example is also quite easy. The designer need only indicate that this variable is enabled for statistics, specify a distribution type, and assign it a standard deviation or variation percentage. This variable is then used in the material stackup profile. When a yield analysis is performed, the value of the dielectric constant will assume a value based on its statistical variation. When manipulating layers, as is done with the layer-based modifiers feature, incorrect numbers can be entered that result in shorts or opens in the circuit. 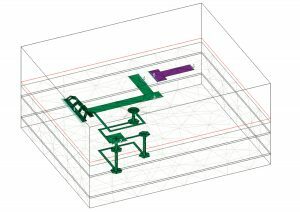 The connectivity highlighter tool in Microwave Office shows if the metal connectivity is changing, enabling designers to ensure that there are no opens or shorts in the circuit prior to simulation. (Figure 5). To speed up simulation run times, the distributed EM capabilities within NI AWR software enable users to send all of the EM simulations to a remote server and distribute those simulations across any number of computers, significantly reducing simulation wait time since the amount of time it takes to get the results back is divided by the number of computers being used for parallel simulations (Figure 6). The results that come back are in the form of data sets that can be used later. 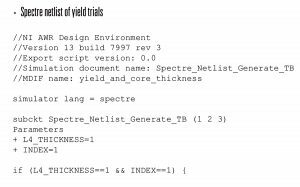 The output of the yield analysis in NI AWR Design Environment is a parameterized Spectre netlist of S-parameters that correspond to the yield analysis trials (Figure 7). This allows module representation resulting from the yield analysis to be utilized in Cadence for design optimization of the RFIC power amplifier. Microwave Office-generated load-pull data files can be used in conjunction with yield analysis to study the impact of module manufacturing tolerances on nonlinear behavior using load pull. These load-pull files contain the A and B waves of the device as a function of load and source impedance presented to the device. A and B waves are used to derive other performance metrics of the device, such as power-added efficiency (PAE), gain, and output power. The performance metrics can be interpolated for an arbitrary load presented to the device. 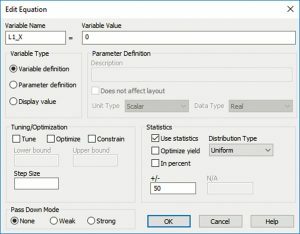 This method can be used during yield analysis and is a great way to quickly get circuit performance metrics for arbitrary loads. This capability enables users to simulate the performance of an active device (transistor or PA) without actually having a device model in the environment, so there is no need to translate the model or have cross-tool process design kit (PDK) support. Secondly, the simulation speed is more like a linear simulation rather than a harmonic balance nonlinear simulation, even though the user is looking at nonlinear results like output power or PAE. 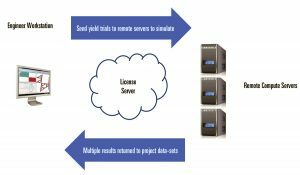 When performing a yield analysis, designers are able to leverage the simulated load-pull data, which allows them to apply an arbitrary load and provide the required interpolated performance metrics. The graph in Figure 8 shows the actual PAE and output power for a yield analysis where the variations in results are due to changing impedances presented to the output of the chip PA by the laminate, highlighting the interactions that occur between the MMIC/RFIC and module/packaging. Once the yield analysis is performed, the designer can identify the parameter sets that lead to yield failures or correspond to the outlier traces shown in Figure 8. Then the tolerances of the yield variables can be changed or the design can be centered so the yield is higher. In addition to yield analysis, NI AWR Design Environment users are able to do a full sensitivity or Pareto analysis. The benefit of this is that all the variables that are set up for yield are weighed against one another, enabling designers to look at which particular parameters in the yield analysis are causing the most change or degradation of particular performance metrics. 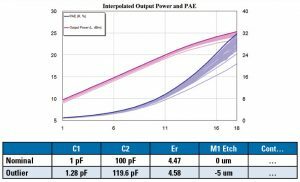 For example, in Figure 9 the sensitivity of the output power and PAE are being examined over all the variables in that particular yield analysis, and those variables are going to be different for each performance metric. This same methodology corresponds to design as well as yield. The PCB/module designer can perform a parametric design and export it as a parameterized netlist into Cadence, where the IC designer can understand the design constraints and optimize the IC in order to get the best performance out of the total module (Figure 10). With a parameterized laminate, the IC designer working in Cadence is not constrained to a “fixed” laminate model and can explore different variations within a single, parameterized laminate model block. 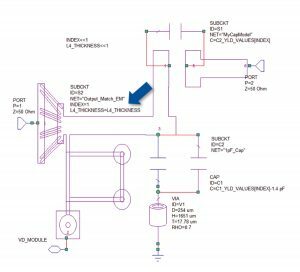 Because of the large number of independent variables in module design and analysis, it is important to leverage a design flow that can handle yield analysis with a large number of independent variables. The Monte Carlo approach within Microwave Office software provides a more efficient analysis than traditional corners analysis. Microwave Office shape/layer modifiers enable designers to look at the actual manufacturing variances that occur in modules, such as registration error or edge tolerance. In order to minimize simulation time and get results back more quickly, designers can leverage remote simulation servers in order to take advantage of distributed parallel EM simulation. Finally, by creating Cadence-compatible models and parameterized Spectre netlists, NI AWR software further enables designers to combine simulations and look at the full system simulation and verification.